RIM hasn't announced a BlackBerry 10 phone at BlackBerry – but a developer prototype has given some clues about the BB10 OS, and we've got our hands on the next-gen blueprint device. You can make calls, browse the web and snap photos with it but this sleek black touchscreen phone isn't the first BlackBerry 10 phone we'll see around autumn 2012. Check out the video below to see BlackBerry 10 running on the Alpha phone handset. This is the phone RIM is handing out to around 2,000 developers this week at the developer-only BlackBerry Jam event (with new developer tools including the Cascades framework that will give BlackBerry 10 apps their signature look), so they can build apps before it comes out rather than after. But it does tell us more than just how much RIM wants apps, lots of apps (and decent ones at that) for the phone. The Dev Alpha is running a modified version of the PlayBook OS, with the PlayBook interface and gestures, so there are few clues about the final BlackBerry 10 user interface. Don't take the design as a hint about the final look of BlackBerry 10 devices either; visually, this is a cut-down PlayBook, from the soft-touch rubbery material and metal BlackBerry logo on the back to the curved corners and the slight lip around the glass front. Even the silk-screen printing that promises 16GB of storage looks the same, and the micro USB and HDMI ports look very similar, as do the three buttons on the side – although the middle button looks more like the programmable 'convenience key' on current BlackBerry devices than a dedicated play/pause button. 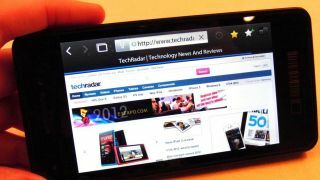 "It's not the final hardware at all or the final OS at all," RIM's director of product management Tim Neil told TechRadar; he calls it "very much stripped down" and "much like the PlayBook devices" and designed to let developers see what their apps will look and feel like, not what BlackBerry 10 will look and feel like. What is final is the 4.2-inch screen size and the 1280x768 resolution. That's higher than the 960x640 of the iPhone 4S (and makes fonts in the version of the PlayBook OS running on it look tiny). "This is your screen size and resolution," Neil confirmed "this is what you're going to be building for as a developer." The spec of the Dev Alpha isn't important beyond the screen size and resolution, according to RIM; this is more a test device than a true prototype. But it should give a realistic feel for app performance, Neil said. "You can expect to see at least the same performance. As we're still tweaking performance in Cascades and the underlying system, even if there were no underlying hardware differences in the phones, [BlackBerry 10 is] still going to be faster as we move through and optimise," added Neil. We also spotted a front-facing camera, a very visible proximity sensor and a large speaker across the bottom of the phone (with connectors that might fit into a dock). The rear camera has a flash. The headphone socket is on the top, along with a microphone for noise cancellation. There's no room for a microSD slot; instead there's only a port for the SIM to fit into. Rather like the HTC One X, the Dev Alpha has a tray for the micro SIM to keep the lines of the case sleek and stylish; unlike the Lumia it doesn't come with a special tool to get it open – you can just use a paperclip. Like some current BlackBerry handsets and unlike the current PlayBook (although there's an FCC filing for a PlayBook with HSPA+ and NFC), the Dev Alpha has NFC support with an intriguing option: you can choose to allow NFC use even when the phone is turned off. You'd need your phone turned on to use NFC for pairing devices, or if you have a wallet application that needs to be running to make a payment, but presumably this means that if you've set it up in advance, your BlackBerry could still unlock the office door or let you use it like a credit card if you battery runs down. Just because the Dev Alpha is a touchscreen phone doesn't mean BlackBerry 10 devices won't have physical keyboards; we expect to see at least a slider model, because the keyboard has always been a BlackBerry highlight, and the PlayBook OS can already suppress the onscreen letters when you attach the Mini Keyboard case. The screen resolution looks good for now, and performance already seems fairly zippy, especially from the WebKit browser. But we don't expect to see BlackBerry 10 devices on the market until later in the year and other hardware could have overtaken these highlights by then. The user interface will also be key and that's going to look a lot less like the PlayBook and a lot more like the Cascades demos RIM has been showing off. Put it together and it could make an impressive package – as long as RIM doesn't wait too long.